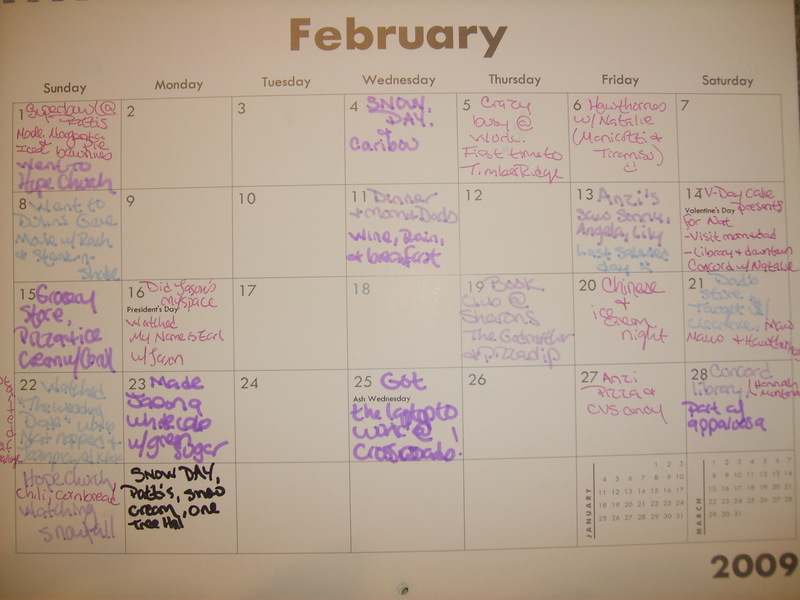 The Calender Project, March 2009 – looks like it was a good month! Also, I thought it would be interesting to link to a few things I wrote last March, so that’s what’s up with that. March 19: Book Club @ Renee’s! March 31: Nat 3 year check up, All good! 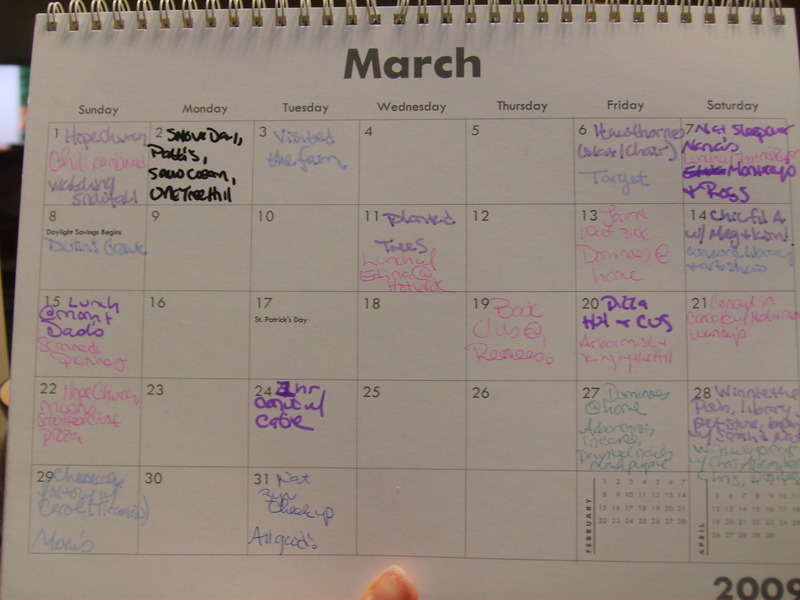 After looking over this months and February’s, food is obviously an event it my life ;P Particularly pizza. And I was all about going to Concord last March, wasn’t I? It’s funny, when I’m recapping, I always wonder what I’ll be thinking next year of this year…by the way, the (Nat/chair) thing was Natalie falling out her chair/booster seat and everyone in the restaurant noticed before us! We’re good parents. February 15: Grocery Store. Pizza and ice cream w/ Carol. February 16: Did Jason’s Myspace. Watched My Name is Earl with Jason. February 25: Got laptop to work @ Crossroads! Last year for Christmas, my sister gave me a calender from Shutterfly.com with tons of pictures on it. I knew I obviously wasn’t going to throw this away when the year ended, so I decided that I would write little memories/events throughout the year and keep it as a sort of shorthand journal. Now that the year is done and I am looking back over this, I’m so glad I did it. I gave up truly journaling to document daily experiences a long time ago, not because I didn’t think it was worth it, but more because I would feel like I had to record EVERYTHING and didn’t always feel like I had the time. Not to mention, I ran out of journals at one point and started using notebooks, which turned out badly because I also used notebooks to make lists, draft poems, do preliminary paperwork for work, doodle, etc. As a result of this, I have tons of random, but I fear kind of important, notebooks that I can’t throw out, but take way too much energy and time to actually organize or utilize at this point in my life. This is why blogging appeals to me, as well as why facebook statuses, and this calender project appeal to me. It by no means captures the whole picture, or all the nuances of a day, a month, or a life, but I daresay it’s better than nothing. And as the year went on, sometimes I really needed to look at the calender and see that life was still happening, life is still good, even when bad things happen. There’s a possibility that recording life, particularly good things or meaningful things improved my ability to live in the moment this year. I also made a “Year List” of things I wanted to do or accomplish during the year, which I think was useful as well. But that’s another “Project”. 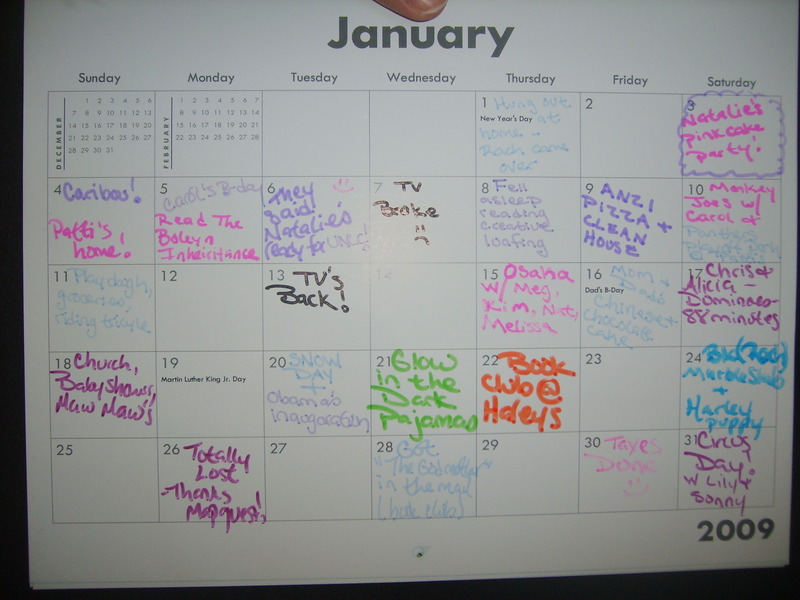 So, with no more chit chat about it, here is January 2009, as recorded by me, on my calender. Jan 3 2009: Natalie’s Pink Cake Party! Jan 4 2009: Caribou! Patti’s home! Jan 13 2009: TV’s Back! Jan 26 2009: Totally Lost – Thanks Mapquest!